Dr. Roman W. Buchok died peacefully on Tuesday, October 21, 2014 at Extendicare Tuxedo Villa. Roman was predeceased by his spouse of 63 years, Maria Cruz Buchok. He is survived by their five children: Roman (Marie) and their children Roman Alexander, Kathleen (Justin) and Celia; George (Marsha) and their children James, Thomas and Anna; Carmen (Jack) and their children John Roman, Andrew and Katie (Jason); Linda; Jim (Pamela) and their children Matthew, Sacha and James; great-grandchildren Nola (Kathleen) and Alice (Katie). Roman was born June 12, 1924 in Ukraine. Following the Second World War he studied medicine in Spain where he met Maria. They immigrated to Canada with their infant son Roman in 1952, living in Grandview, Ethelbert and McCreary before settling in Winnipeg. Roman was a physician and surgeon in Winnipeg from 1957 to 1996. 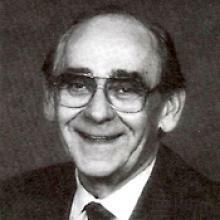 He founded McGregor Medical Centre in 1959 and also served many patients in Winnipeg hospitals, primarily the Misericordia. Before his retirement he was Chief of Staff at Seven Oaks General Hospital. Funeral Liturgy will be celebrated on Friday, October 24, 2014 at 10:00 a.m. in St. Joseph’s Ukrainian Catholic Church, 250 Jefferson Ave., with Fr. Bohdan Lukie presiding. The family wishes to express its thanks to the doctors and staff at Extendicare Tuxedo Villa. Make a Donation to the Grain of Wheat Fund in memory of Buchok, Roman W.